It's been a while since I have shared what's in my lunchbox with you, so let's start this week with a peek inside. With family visiting, a weekend away, summer activities, and a lot of moving-related running around I have been eating out a lot lately. To try to find some balance, I'm packing something super healthy for lunch this week: Warm quinoa, spinach, and sweet potato salad. This salad makes a super satisfying lunch. You could add grilled chicken to it, but I find that with the hearty sweet potatoes and the protein from quinoa and walnuts this salad is really filling without meat. In fact, with the exception of the honey this could be a totally vegan meal too (just sub maple syrup for honey)! The flavor combo here is great. There are a ton of savory ingredients in here like nutty quinoa and walnuts, fresh spinach, and the meaty and slightly sweet roasted sweet potatoes. I love the addition of dried cranberries to this salad-- they add a really nice pop of sweetness. Topped off with a tangy vinaigrette, this hits all the right flavor notes. In a medium mixing bowl, toss sweet potatoes, red onion, garlic, salt, pepper, and olive oil to coat. Spread ingredients out on a large rimmed baking sheet and roast for 15 minutes. Remove from oven, stir, and roast for another 15-20 minutes until onions are soft and sweet potatoes are toasted on the outside and fork tender. Remove from oven and allow the ingredients to come to room temperature. 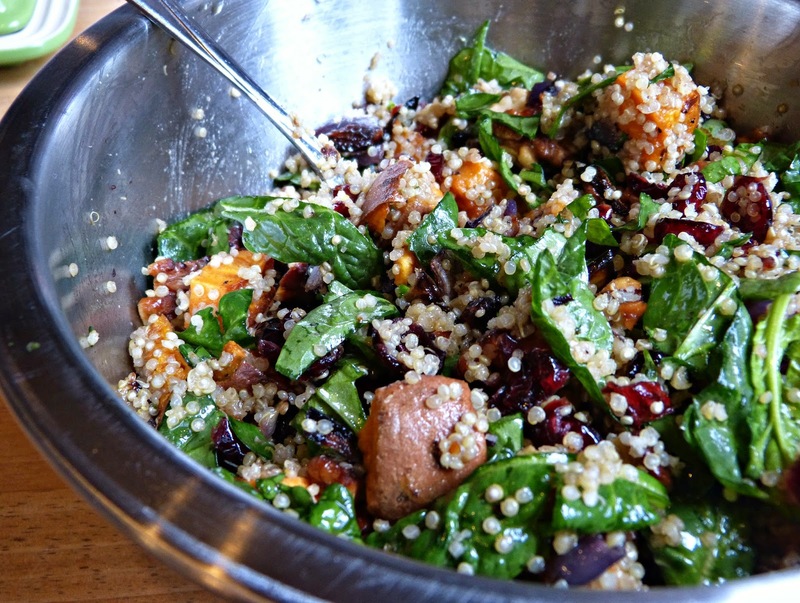 Add the potatoes to a large bowl along with the cooked quinoa, chopped spinach, cranberries, and toasted walnuts. In a small bowl, whisk together honey, mustard, vinegar, oil, parsley, salt, and pepper until combined. Pour over the sweet potato mixture and toss to coat. Season with any additional salt and pepper as needed. Serve warm (not hot) or at room temperature. Looking for another healthy salad recipe? Try Roasted Vegetable & Spinach Quinoa Salad or Italian Tuna & White Bean Salad! I could totally go for this in my lunchbox right about now! YUM. It's such a good make ahead lunch!